Porsche unveiled the new Cayenne, including the manufacturer's first-ever hybrid, at the Geneva auto show. “We're looking at an incredibly high order intake from almost all markets,” Macht said at the German manufacturer's factory in Leipzig, where the next generation of Porsche's best-selling model was presented. “Orders are clearly exceeding our expectations.” He didn't give figures. Porsche plans to add models with a goal of doubling yearly sales to as many as 150,000 vehicles over the medium term, and benefit from savings from a merger with Volkswagen AG, Macht said. Deliveries in the six months ended Jan. 31 fell no more than 1.7 percent to 33,670 units, compared with a decline of 40 percent in the first quarter. Volkswagen agreed to merge with Porsche in August after the 911 sports-car maker's debt tripled to more than 10 billion euros ($13.6 billion) following a failed bid to buy Volkswagen by securing stock through options transactions. Macht yesterday disputed an April 8 report by London-based Sanford C. Bernstein analyst Max Warburton saying tax and legal issues could derail the planned fusion. Porsche rose as much as 59 cents, or 1.3 percent, to 46.30 euros in Frankfurt and was little changed at 45.70 euros as of 9:40 a.m., valuing the carmaker at 8 billion euros. Porsche unveiled the third generation of the Cayenne, including the manufacturer's first-ever hybrid model, at the Geneva auto show in March. The upgraded SUV offers the performance of a V8 engine, though its fuel efficiency matches that of a gasoline-powered V6. 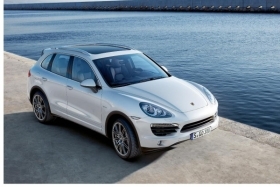 Sale price for the new Cayenne starts at 55,431 euros ($75,700) in Germany. Deliveries of the current generation tumbled 25 percent to 34,300 units in Porsche's fiscal year ended July 31, 2009. Porsche sold “clearly” more cars and SUVs last month than in previous months and compared with March 2009, helped by the Panamera sedan, Macht said. The carmaker “firmly” expects to boost 2010 deliveries beyond last year's 75,200 units, the CEO said.